Can an Elevator Be Racist? Home » VIDEO – Can an Elevator Be Racist? VIDEO – Can an Elevator Be Racist? This entry was posted in Video and tagged discrimination video on September 25, 2013 by Tom Grundy. Share the post "VIDEO – Can an Elevator Be Racist?" Can an elevator discriminate? One of the most common complaints from HK’s foreign domestic helper community is that of ‘day-to-day discrimination‘ – a phenomena which can often be difficult to prove. However, a video commissioned by the upcoming HK Helpers Campaign revealed how Causeway Bay Centre Shopping Arcade (near Victoria Park) is in the habit of charging HK$5 for the use of their elevator. Manned by two security guards and surrounded by ‘no photography’ signs, the fee is only applied on Sundays, when Indonesian maids pour into the area on their day off. In the US, as Jim Crow laws were deemed unconstitutional, many businesses attempted to sustain unequal access to services through similar convoluted means. 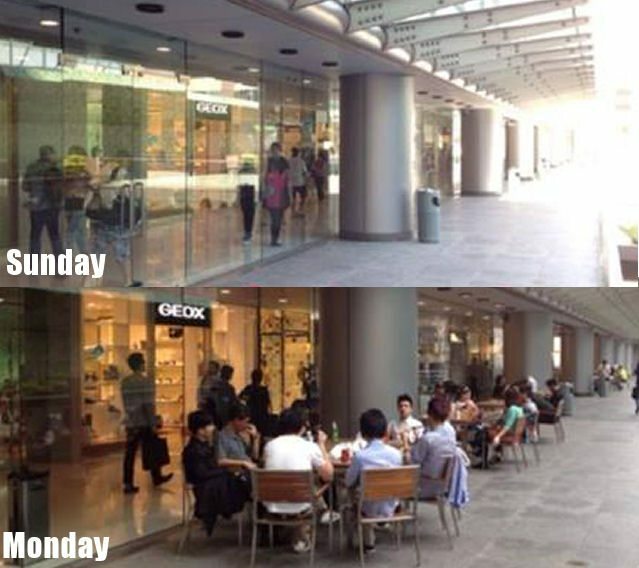 Are HK’s businesses and service providers discriminating against a group of people or against a day of the week? If services cannot be applied consistently for all sections of the community, then perhaps they should be scrapped altogether? If you are a blogger or media organisation, our coverage/photos/videos are available for re-syndication free-of-charge, please get in touch. ← PHOTOS – Why Do You Do What You Do?